Firstly to engage with and educate tour operators and facilities, surrounding the cub petting / lion walking industries. Secondly to engage with governing bodies and certification / accreditation organisations to see how the industry views these activities and how this could then be used in the campaign’s favour. The show was very well attended and we have noticed how there are fewer operators punting the lion walking and cub petting industries. This is good news and shows that through open communication and education the majority of organisations have become aware of the spin-offs associated with these activities. To them I say “Bravo”! Sadly, some of the larger, more affluent safari lodges are not even prepared to discuss canned lion hunting nor acknowledge that the cub petting / walking with lion activities form part of this sordid industry and refuse point blank to even accept one educational leaflet and are arrogantly dismissive. Certification and accreditation organisations are starting to openly discuss responsible tourism and grading / accreditation guidelines, but seem to be hedging and awaiting input from specific organisations before putting this system in place. The words “regulatory capture” spring to mind and we all know that certain organisations will serve their own financial interests before animal welfare and true conservation. WTM Africa has been worthwhile attending and very good for the campaign. 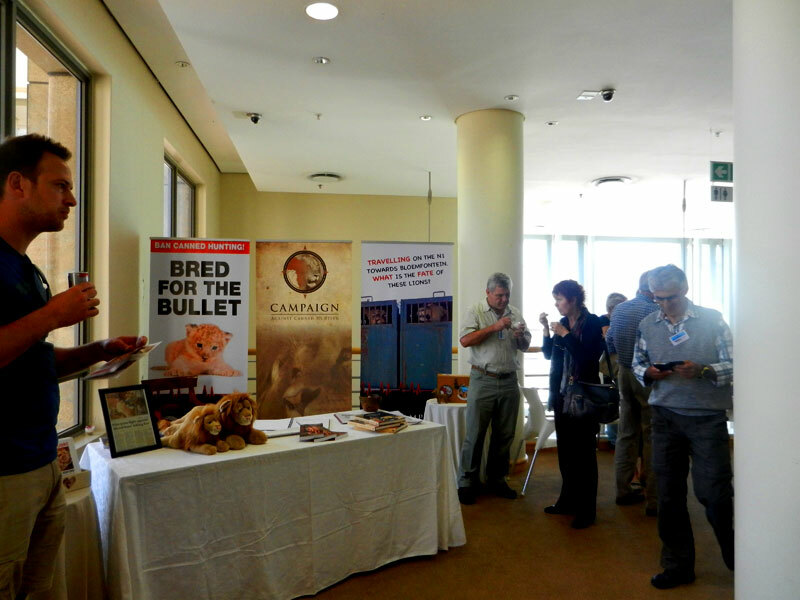 The Expo has given valuable insight into the tourism industry and how the majority are against the canned lion industry. There is a big negative too, WTM Africa only covers a small percentage of all the tour operators and facilities out there and it is those whom we need to engage with. 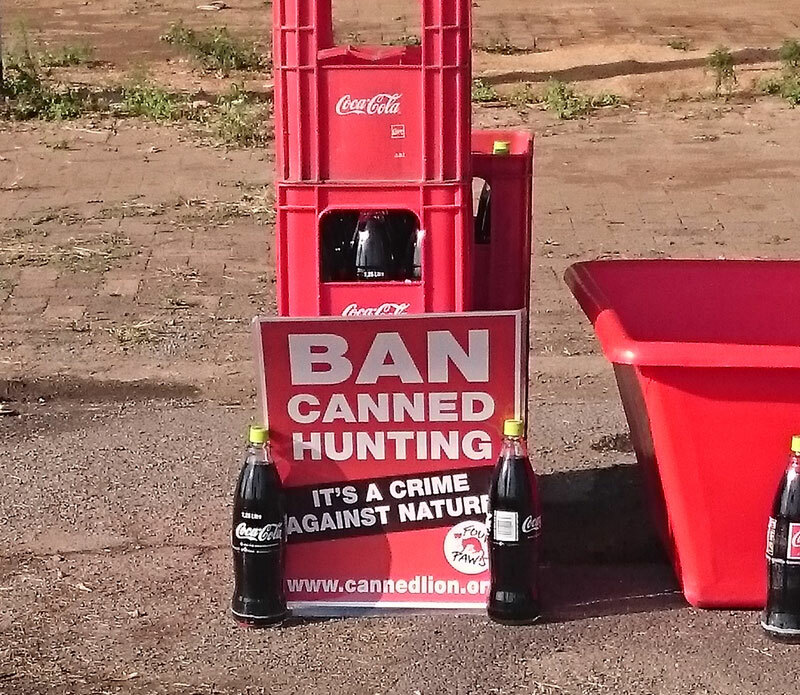 Accreditation and Certification organisations need more exposure to the canned lion industry – the old saying “how can we expect the outcome to be different if we keep doing things in the same manner” rings true. The CTUFA march was organised by BWC, Talking Tree and IFAW. large gathering of people and included approximately 85 Organisations and Local Businesses. 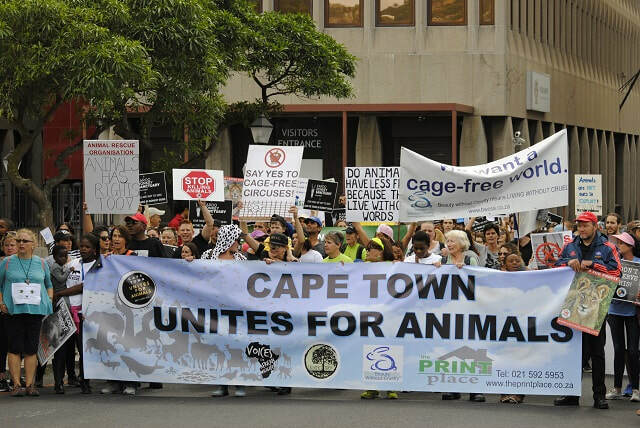 Global March For Lions 02 April 2016, Cape Town. 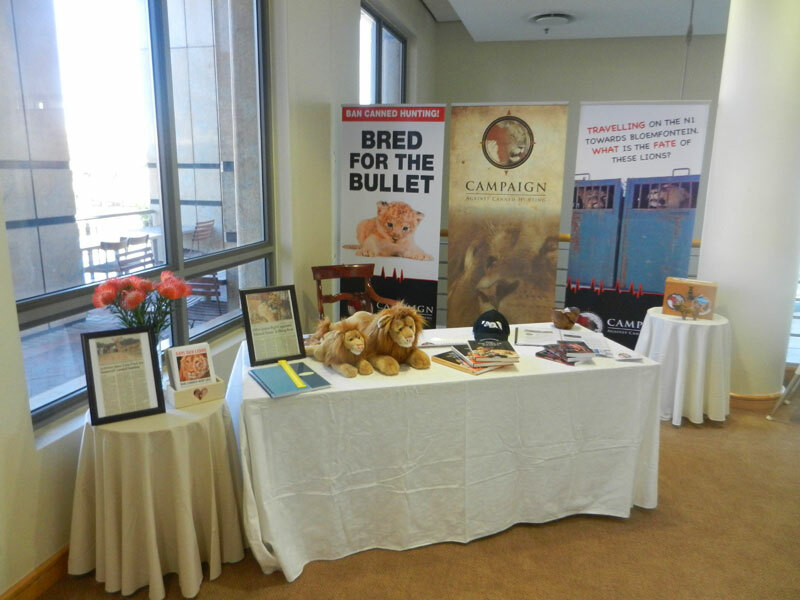 This year’s Cape Town event was once again organised CACH in a collaborative effort with Beauty Without Cruelty, Four Paws and in support – The Global White Lion Protection Trust. With over 200 protestors in attendance our event was planned to obtain maximum exposure, by marching through the city in one of the most frequented tourist areas (Long Street) and ending in the Company Gardens where we ended the day with speeches by the Directors, Country Managers and Chairpersons of the various organisations – our letter of Protest was received by Ms Liezl van der Merwe, MP (IFP) who addressed the march on behalf of Prince Mangosuthu Buthelezi, MP (IFP). Locally we had representatives from Rustenburg Girls High School who once again showed their commitment to saving our lions and to them I say a heartfelt thank you. We had very committed people in attendance from as far as New York and Australia, people from all over the world who sent messages of encouragement, whose sole reason for doing so was to be the voice for the voiceless – it is indeed an honour to have you with us. Kenesias, once again adding the much valued energy to the march. To the many residents of Cape Town who steadfastly attend year after year walking the talk, knowing that the battle continues even after the march; we do not quit, we do not back down and we will win. A great turnout for a venue that is 1.5 hours out of Joburg in the North West Province. It was colourful and brimful of energy. Fats and Moji led the way and kept the crowd moving and singing. Really grateful to Fats who has been by my side since our first March in 2014. He has been seriously ill and hospitalised and I thought he wouldn't make it but his spirit and unwavering belief in the cause got him there. It would never be the same without him, Moji and the team from Zola. Also there were a group of Soweto Mini enthusiasts and some bikers from the East Rand Database group. Thabiso made sure his bike added to the roars of the crowd. Apart from a couple of hunter types who hurled abuse at us as they drove past, we had so much support from both truck drivers and motorists who hooted and waved when they saw us. Locals I spoke to said they were concerned about the number of Wildlife petting/interaction facilities were continuing to spring up in North West. I mentioned that Jonny Rodriguez wife Cheryl had passed away and asked the crowd to hold them both in their thoughts. We had a minutes silence for Cheryl. At the end of our protest we closed with the National anthem led by Moji who by then was losing his voice! I think the piece that Moji wrote on the Friday night really sums things up perfectly. We are gaining momentum. Parklands College and Table View High School are probably going to be next, so happy that we are getting the message across. Today went so much better, I shortened the presentation and added my story in (chatting to Lu-Jaine, she confided in me that she was devastated that she had petted cubs previously – hence my story), we cannot change the past but we can certainly change the future. The school will be joining us at the Global March For Lions in Cape Town on 2nd April, advertising and sharing the event. The Head Mistress was very complimentary and I overheard her telling girls as we were leaving that having such a passion for wildlife is something they should all aspire to! ​Friday afternoon kicked off with the GMFL Meeting at the V&A Waterfront with Four Paws and volunteers in attendance. 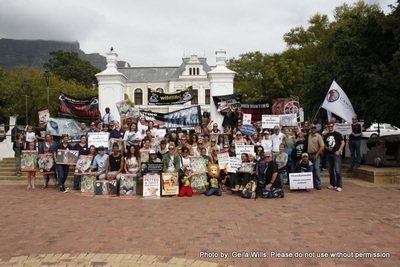 With other protests on the go BWC was unable to attend but we are now all in agreement to the way forward – GMFL Cape Town is going to create such great awareness and collaboration is the key – the route is confirmed and we have the support of, probably all NGO’s in the Western Cape which is wonderful news. Saturday Evening was all about community work, assisting in the Milnerton Beach clean-up, although not a protest, CACHs’ presence is starting to show that collaborative work in itself is a form of awareness. We hope to be doing more of this in the future. 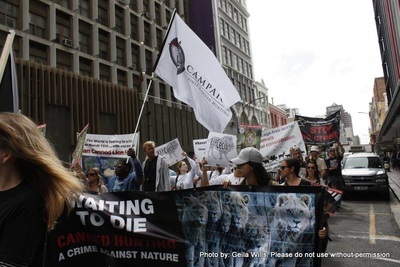 Sunday morning was the HuntexCape Expo, the static protest was organised by BWC. 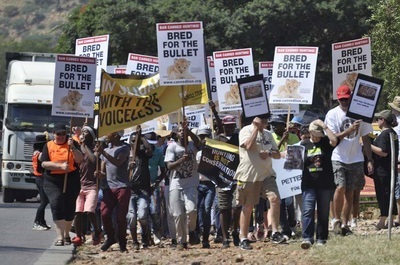 A small group of BWC, CACH members and volunteers gathered outside the entrance to the Rheebok Wine Estate venue, just outside Paarl, to peacefully protest the exploitation of our wildlife. Members of the press were present and many of the people attending the Expo used wonderfully colourful language to describe the group, there were some who supported us and if we open one person’s eyes it is all worth it. Many thanks to all who attended and we welcome Dylan and Angie who have volunteered their time to CACH in our campaign. 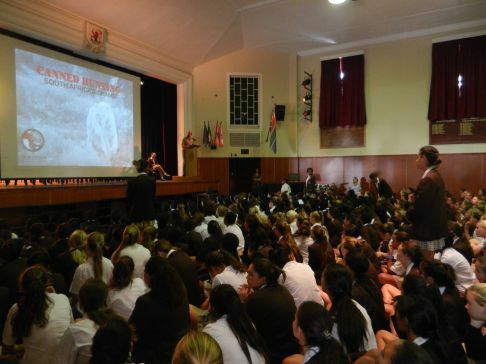 ​CACH was asked to be a guest speaker by Chloe van Niekerk to present what canned hunting is and what can be done to eradicate this barbaric practice to the pupils of Wynberg Girls’ High School on Thursday 25th February 2016. Philip Pitout CACH Cape Town agreed to do the presentation. 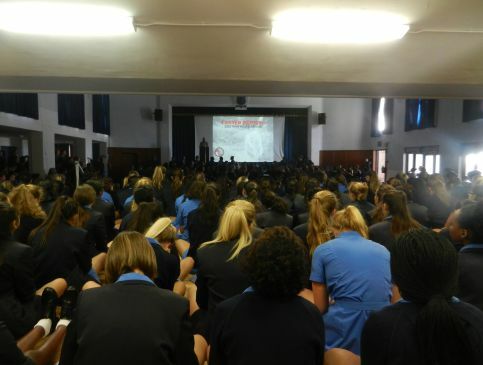 The school has a total of around nine hundred students and the presentation was well received, this being the first of two presentations to be held at High Schools in Cape Town this month; it is refreshing to see such positive interest and concern for our lions. We would like to thank the school for their support of our campaign and specifically Chloe van Niekerk (Head of Service – Enviro Club - pupil), Huda Ely (Learner Head of Service - pupil), Jenny Paverd (Head of Service - Teacher) and Shirley Harding (Head Mistress). Arranged by Stefania Falcon, CACH was fortunate to be given a stand at the German International School Bazaar. The event is run by the school as part of a fund raising effort and has a public participation of around 6000 visitors. We started the morning setting up the stand and by ten o’clock the event was well underway. 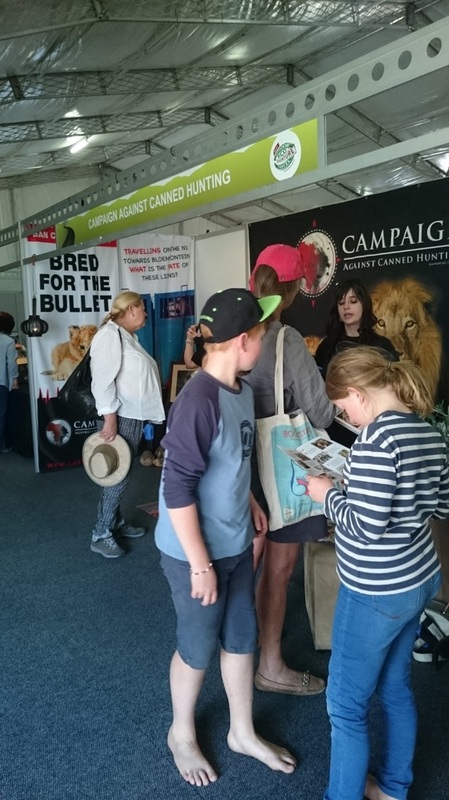 We had a competition for the kids with prizes for the best colouring in and this made the stand very popular, this also gave us an opportunity to chat to parents regarding the sordid canned lion hunting industry and spread the awareness. We had a huge interest from people from all different walks of life and it was heartening to note that almost all are of the same opinion, that the industry should be shut down and our lions given the protection they deserve. The children also walked away with the understanding that cub petting leads to a horrible end for our lions and I am pleased to say that they all said no to cub petting. Old friends stopped by to chat, new friends were made and many tears shed, it is good to see how many concerned people out there want to get involved through company sponsorships, helping out at shows, volunteering at the KWC or simply spreading the awareness, to you - we say thank you ! CACH was commended by a large number of individuals and companies at the Bazaar for the work that they do and this is testament to the directors and all the representatives of CACH worldwide who volunteer their time to work for a campaign which is sometimes heart-breaking. ​CACH, Cape Town were fortunate this year to be given a stand at the Wildshots Photographic Symposium, held at the Nedbank Auditorium V&A Waterfront 24 October 2015, where around 300 Professional and Amateur Photographers alike come together to share a day of inspiration and knowledge. 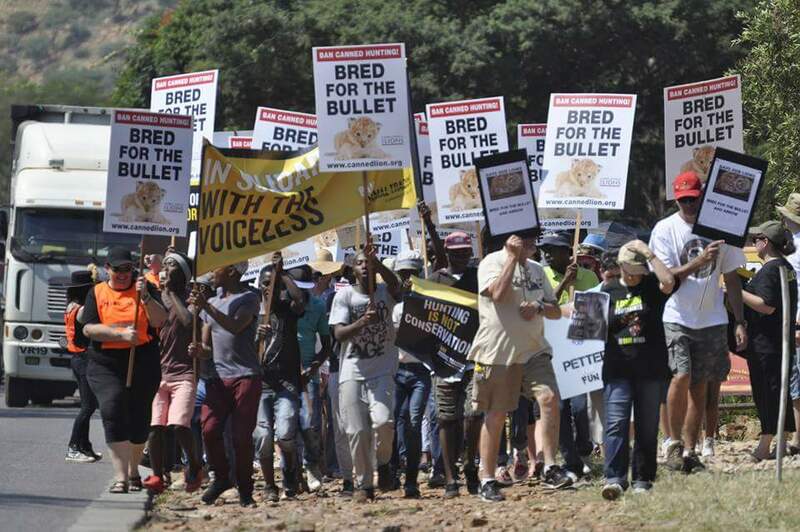 We felt it would be a good platform for us to share awareness of the deplorable act of the canned lion hunting industry as well as spread the word of the beginnings of the KWC. The day started early Saturday morning and we were quite pleased to see that the majority of people attending were complimentary of the work done by CACH and the level of dedication by the global network of representatives. People from many diverse walks of life were in attendance, many from the safari and tourism industries, which gave us an opportunity to impart knowledge and dispel the myths surrounding the “release into the wild programs” flaunted by many to be ethical tourism. A few hunters were in attendance as well, some were quite open and honest in sharing their disgust at the canned hunting industry and others tried to justify the industry using the “conservation of wild lion population” ploy. We also made many new friends who expressed a keen interest in assisting in the awareness campaign as well as asking for more information about the Karoo Wildlife Centre ! In all the day was a success and we look forward to next year’s Cape Town event. The stand was kindly sponsored by Wildshots and many thanks to both Sophie and Harriet for this opportunity. They will be holding another symposium in Jo’burg on the 21st November 2015 at the Nedbank Auditorium, Sandton. Visit www.wildshotsevent.com for more details. Having been invited to have an awareness table at the Heron Bridge College Wild Day this morning, Drew and I set up at 8am. The college is dien the road from the Lion Park.What an absolutely beautiful setting on the banks of a river - a real haven of peace and tranquility. The school had organised a Paw Family event where families put painted hands on fabric and encircled the family unit, often with a message. The idea was to enforce the message that families belonged together and that cubs should not be removed from their families. Of course we had to add our Paw prints too! We had interesting chats with adults and children alike and shifted some points of view. Two young boys gave us some precious pocket money. I felt so bad taking it from them but knew it was important for them to have given it. These kids were really sensible and aware which gives one hope for a better future. There was a really informative snake talk and demo on the lawn in front of us. Hmmm - Drew and I decided we'd rather take our chances with lions! We left a batch of flyers with the school to keep the message circulating so a worthwhile morning all round. We would like to thank the Jozi team for their dedication and passion. 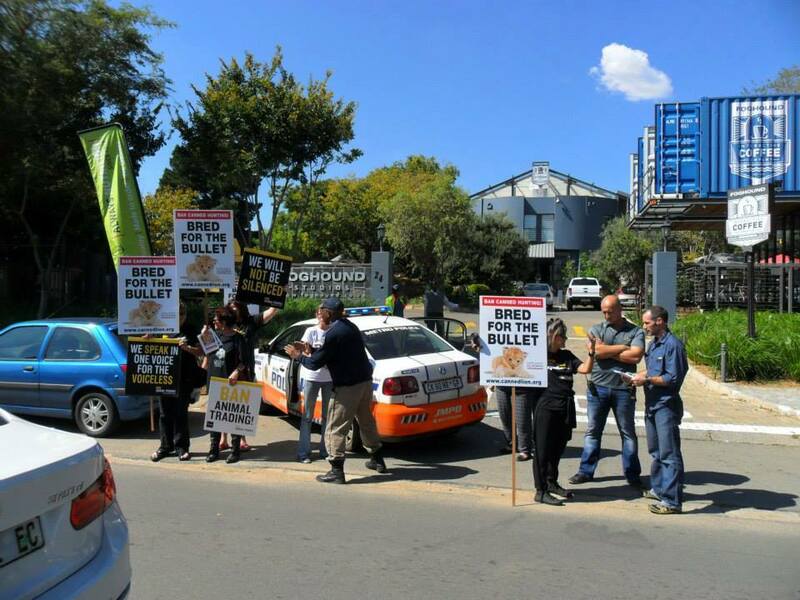 Three days on their feet to spread the word on the canned hunting industry's deadly business. We were given the opportunity to have a stand this year at the Outdoor Expo which was held over three days – Friday – Sunday. After our first stand last year, we knew what to expect and setting up on the Thursday went very smoothly. Friday opened and Chris V and Linda were ready. We didn’t have to wait too long for the first visitors to stop by and then we started talking and didn’t seem to stop until Sunday night! We had a number of hunters stop and try to bait us but, with the exception of one who wanted to know “what are the difference between a lion and a cattle (sic)” we managed to find some common ground and get our message across. Saturday started with Chris V and Linda with Drew joining us later. We were very busy, particularly in the morning, and were never without several people on the stand. Some old friends dropped by too – Philip & Jeanette Pitout were up from Cape Town, Alan Pollock (our No. 1 Marshall) and Fats and his three daughters who are always at the front of our marches with their dad. Real daddy’s girls! Sunday we had Stef Oels join us from first thing and we were asked to set up something across the aisle from us to fill an empty space. Quick message to Drew to bring our green banner and a couple of CIA pull ups for colour and we managed to make something fairly respectable. Now there were four of us – two each side – and still we kept talking! We certainly spread the word and there were many who had no idea what happened to cubs they had petted but who certainly would no longer be petting any others. We also picked up some interesting information. Many people said they would sign up for the CACH newsletter so even if a fraction of them do, they will in turn inform their friends. By Sunday night breakdown we were all very tired – three days solid on your feet takes its toll! – but certainly happy that we had done a good job for the lions. Outdoor Expo is a great platform to reach a large number of people and we are certainly up for the challenge! We had two packs of Lion beer which had been sent up by Chris & Bev. Drew’s husband Brian (honorary Jozi lion!) popped in on Sunday and did some Abrahamson Auction via cellphone – he raised R1,250 You can understand why he is an honorary lion! We were more than a little happy. Team Jozi again hosted a water point table for for this annual event, hitting the road at 6am for a 75km trip to where we were stationed, 35km from the finish. Linda, Drew, Chris V and our stand in lions Brian and Mia set up and displayed our banner on the road where it had high visibility. The race had about 5000 entries. We didn't have much to do as the pros flew past us in large bunches, completely focused on times. Many tired and sore bodies (we had Arnica massage gel on hand too!) led us to wonder why people do this for pleasure. We all agreed we'd rather have fun at the water point. It was a fun morning with beautiful weather which was lucky as the afternoon turned to one of rain and cold. We will be back again next year. It was an excellent evening with Marnus giving a very passionate talk about the amazing work WFL are doing with lions in Botswana. He is going to do a report for our page next week so I won't steal his thunder except to say that I think he is doing some really valuable work and I wish we could clone him. His passion for lions is a really beautiful thing to see. Dr Sam Ferreira from SanParks gave an interesting talk on wild prides in Kruger with particular focus on bovine TB. Have taken pics of some of his slides if you're interested. Also interesting was how they do their call-ups and how quickly lions come into the call-up area. Any ideas people may have had of outrunning a lion were swiftly dismissed! He mentioned that there is a pride at Singita that comprises 42 lions! Wow - can you imagine seeing that! I did the big cheque handover with Chris Herbst and said a few words about the importance of lions in the wild and the value of the work WFL is doing in trying to protect them. Our logo was flashed on the big screen throughout the night, along with all the other sponsers. There were some fabulous prizes on auction and I think the target for the night was certainly met. I had fun on the auction too! 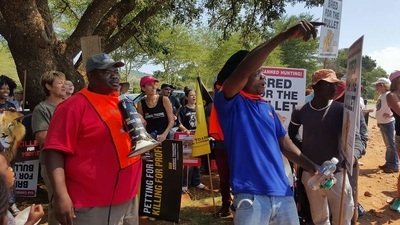 The Cape Town event, although not as well attended as last year was a demonstration held outside Parliament where a memorandum was handed over to the IFP Chief of Staff, Adv. Anthony Mitchell by our Chris Mercer. 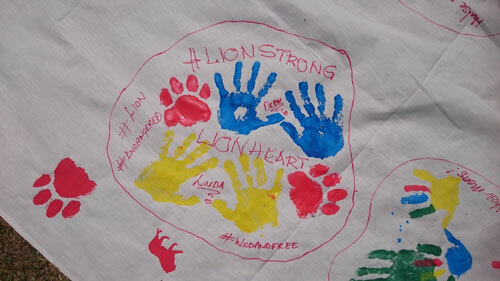 The event was supported by about one hundred lion warriors, Four Paws, Beauty Without Cruelty, Baboon Matters Trust and the Global White Lion Trust. Considering the long hours, for days on end, that all of the above worked - caring for all the animals left homeless and injured due to the wildfires that had spread through the peninsula, this review is testament to them, they gave their all and still came out to fight for our lions! The speech by Adv. Antony Mitchell reminded us of Mario Oriani-Ambrossini who despite his terminal illness fought so bravely to rid South Africa of the canned lion hunting industry. A true Warrior for our Lions. Chris announced the decision made by the Australian Government to ban the import of any Lion parts or remains with immediate effect, a battle won by any standard, he also discussed regulatory capture within South African Conservation and the battles that surely lie ahead. The crowd, as ever, was there to roar for our lions and roar they did. Led by Toni they created an awareness that the general public will never forget. As the day ended, listening to a pride of lions roaring over the sound system, one can only imagine the day when we can see our Lions roaming free. Until then, for your freedom we shall fight….. Perfect weather greeted the day. We arrived across the road from the Lion Park at 09.30 to set up and marshals began arriving shortly thereafter - real eager beavers! And the cracker over a photograph of Chris Mercer - "What's so special about lions?" All animals are special Mercer, not just lions. After JMPD (Johannesburg Metro Police) arrived an argument ensued. Metro telling Rodney Fuhr that he was not allowed to protest because he didn't have a permit. Rodney Fuhr getting very heated and putting his hands out saying "arrest me then". It was eventually agreed that they stayed behind their traffic tape and that we had access to both sides of the road! We started at 11 with a birthday song for Drew, messages from Kevin Richardson and Gareth Patterson and an explanation of why we were doing this. Fats and Moji also spoke about how important wildlife was and how we need to teach the children these values. Next up was a praise singer who sang about saving our country and all the wild animals. Then it was over to Fats, Moji and crew who sang, danced, drummed and drove the crowd. Our numbers continued to grow as people kept arriving and it was estimated that we were more than a thousand. The Lion Park protesters were getting quite unruly and kept trying to break out of their area. JMPD called for reinforcements and the park driveway ended up being covered in police vehicles. One of their employees (I think it was their manager) who was standing next to Fuhr ended up shoving one of our protesters and a charge was laid against him with the police. Their protesters were complaining they were going to lose their jobs which infuriated Fats and Moji. It looked like the hakka with them and their team crossing the road and challenging the others. 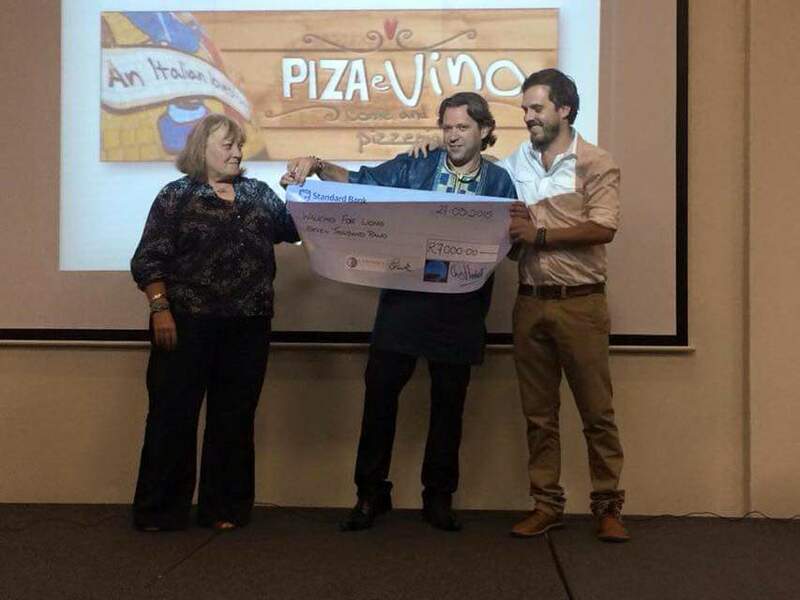 The gist of the challenge was "you are getting paid. We are not. We are here because the lions are important. It's not about money". We were loud. We were stretched far down the road but we conducted ourselves well. The police congratulated us at the end about our good behavior. The same could not be said for the Lion Park! It was an excellent protest that achieved what we had set out to do. It was a protest that gave voice to a very special lion for me and to the thousands of lions that have passed through those ghastly gates over the years. And once we left there the heavens opened and we had an afternoon of thunderstorms. A fitting end to a glorious day I thought. A small, but merry band of warriors braved the heat of Durban city centre and marched for our lions. We were delighted to be joined by Hon MS Nkomo MP, Secretary-General of the IFP accompanied by Mr Les Govender, also IFP. Brian Connell gave a brilliant speech. I spoke too. I passed the loudhailer from youngster to youngster for part of the march – they all were very vocal on protecting our lions which was great to hear. Chris Voets and I manned a table at the Parkhurst Antique Car Show from 7am. The day was bitterly cold – around 5 degrees with a howling wind – and we were stationed on the shady side of the street until the sun moved over late morning. We were both a little frozen to say the least! The cars were amazing – antique bikes and one bicycle as well. Watching the amount of effort that went into manoeuvring the vehicles into parking spaces made me eternally grateful for power steering!! We did not sell any T-shirts but handed out some flyers and received a R50 donation for our efforts. I was invited to give a talk at the Esoteric Fare on canned hunting and the captive breeding industry. There were around 40 people who sat down to listen and they were all stunned at the information. It would seem that none of them knew the fate of the cubs they had petted in all innocence (and most of them had!) and there was little understanding of canned hunting. This may have been a small event but it was worthwhile in that it opened many minds who will, in turn, educate their friends. They all took flyers and several took a pile to put on their shop counters so we will reach more people that the 40-odd who turned out. CACH even received a donation of R150 at the end. These kind of events are the opportunities to plant small seeds which will hopefully bear fruit. Never turn them away. Chris and I visited York High School in George, Western Cape to address the students in the Animal Club, This is an active school group that does a lot of good work for animal welfare. Our meeting took place in a classroom where we could connect our laptop to a projector and sound system to give an audio-visual presentation to the students. We introduced ourselves and explained what Canned Hunting was. After the first video presentation, we took questions from the class. 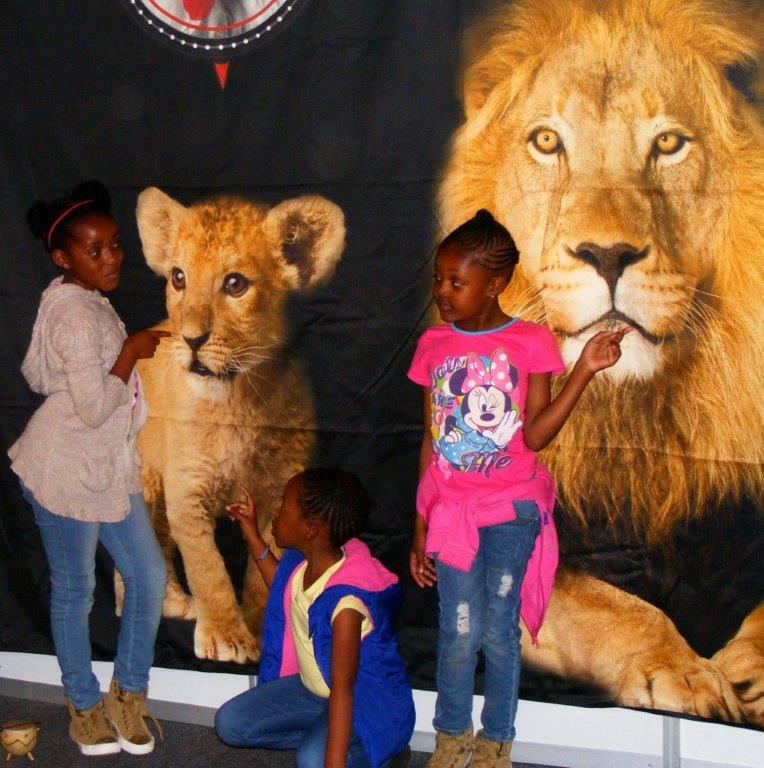 The students were bright, questioning and fully aware that canned hunting took place. After the video they had many questions, mostly to clarify the cub petting issues. They asked some intelligent, relevant and sensible questions, showing us that they had got their minds around the issue and that they were interested in being pro-active to look for solutions to the problem of how to get captive breeding and canned lion hunting banned. We then played the second video, which had a lot of Global March footage. They were clearly captivated by the sights and sounds of all the marches all around the world; everyone marching for South African lions. I ended the session by proposing an essay competition for the students. The subject is canned hunting; whether the cruelty is acceptable – and who should decide; whether canned hunting has anything to do with conservation; and whether the economic benefit to the hunting industry justifies the cruelty to the animals. We believe that education above all else is an essential part of tackling the cub petting and lion walking debate. The positive response from these young students was encouraging. Personally, I believe that canned hunting is an inhumane act. Canned hunting is when lions are brought up in wildlife sanctuaries where they are petted and walked and played with by tourists who pay money and then when the lions are older they are hunted in a small enclosure. Canned hunting literally means “animals in the can”. I believe we need to stop the poaching before it is too late and our children and grandchildren don’t get to grow up with the privilege of seeing a lion. More lions are held in captivity captive than are in the wild and this is unacceptable. The government is in charge of passing the laws about making canned hunting illegal. We should all work together as a nation to stop canned hunting because it is an horrific act of cruelty. You need a permit to hunt and export the lion and the government needs to understand that canned hunting is a terrible act and needs to be banned, because our animals have the right to life and live a lifecycle that is typical of their species. God created animals first and therefore they should always be considered. There are approximately 160 lion breeding farms in South Africa. 8 000 lions are awaiting their death every day. In 10 – 15 years, the rhino, elephant and lion will be extinct. Lions are important in the wildlife cycle of things. If we take the lions out of the cycle, we will experience more and more environmental problems. Many farms/nature conservation places allow tourists to pet the lions and take photos with the cubs. When they reach a certain age, they are hunted. Hunters pay a lot of money to hunt the lions. You can pay up to 25 000 US dollars. These farms/nature conservation places benefit most handsomely in terms of profit. Baby cubs are taken from their mother at just 5 days old. 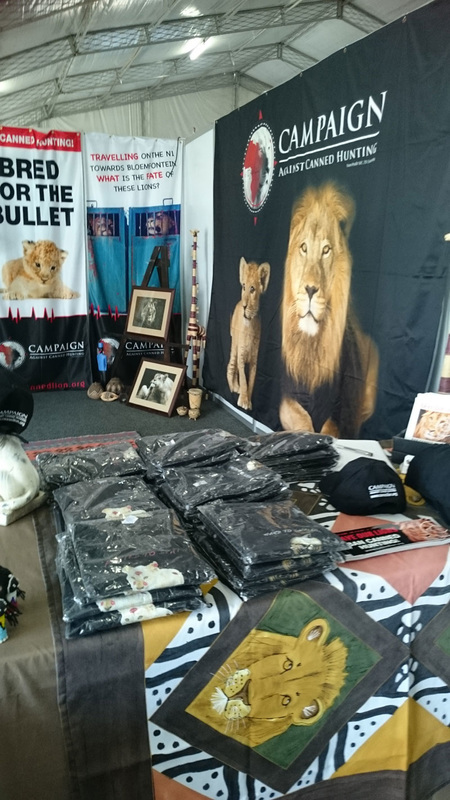 Canned hunting brings in a lot of money for businesses and the government. Due to this, I believe the government is reluctant to stop canned hunting, despite the cruelty thereof. The Vietnamese pay up to 800 US dollars for the bones of a lion. This, as well as other exports, generates a lot of money. Canned hunting is a money-making business that needs to be stopped. It takes up to 8 years for a cohesive pride to come together once the male leader has been killed. 75 % of the lion population has shrunk in the last 10 years. I would have us stand together against canned hunting and to fight for the rights of animals, because we are disturbing the natural animal kingdom. As a nation, we can make a change and a difference in time. I learnt a lot from Bev and Chris coming to talk to us at York High School. I now know more about canned hunting and support this worthy cause. Their passion for animals is evident and I thank them for their time and knowledge. How do I begin to say how cruel this is. Who decided this? How is it acceptable? Does society approve of this? Do people know what canned hunting actually is? Canned hunting is where lion cubs are taken away from their mothers and made tame to attract tourists and make money through lion petting and as they grow older it becomes “a walk with the lions” and when they are too big to handle they are placed in farms where they are hunted . Many times one cannot be angry with people who support this if they have no idea about these precious wild cats. So the motto stands true, ‘Those who know better do better”. How can you accept the fact that one day your children won’t know what a lion was? This is not acceptable. Unfortunately this is legal. I personally think we need to start small to raise awareness and increase awareness to fight for this practice to become illegal. Because I bend not to the will of man, they call me a mystery. Yet they take animals to keep in parks and zoos that they may gape at them. They think all animals are made for their pleasure, to be their slaves. And, while I kill for only my needs, they kill for pleasure, power and gold and then pretend to be superior. Why should I love them? I, the cat, whose ancestors proudly trod the jungle, not one ever tamed by man. Ah, do they know…..that the same immortal hand that gave them breath, gave breath to me? We need to collectively campaign against this cruelty and find a better way for humans to find pleasure rather than killing innocent animals. The Joburg team (Linda, Drew, Chris Voets, Smaragda & Stef Oels) has just completed a very exhausting 3 days at the Outdoor Expo. Thursday Linda, Drew and Chris set up the stand with an unveiling of the new banner which nobody had seen. We pulled together an African themed stand with the help of décor from our homes and posters which we had done to A0 size and laminated so that they can be used again. We also put that heart-rending photo of the two lions in crates that were captured on the N1 in a frame and had that on display. Friday arrived, with Linda, Drew and Chris on the morning shift and Smaragda stepping in for Drew in the afternoon It was a fairly quiet day with not much action. Most people work so visitors were generally retirees who looked like they were out for a constitutional rather than a look see! It makes for a very long day when there is not much happening, believe me! I fortunately had something to do as I had been asked to give a talk each day at Speakers Corner. Would have loved to have stretched my allotted 30 minutes out somewhat. Saturday was a very busy day with lots of visitors. Linda, Drew and Chris were there all day. We had Discovery/Animal Planet filming as well as CNN. Anton from Discovery has been filming some lion stuff around the country and came to the Expo to talk to Drew about rescues. He filmed my talk and ended up filming on our stand where he said he could not have written the script for some of the chats we were having! CNN are putting together something on ecology and the environment. I heard that Wildside magazine had an article on walking with lions in their latest issue and they had a stand up in the main marquee. I took a walk up there and spoke to two very sweet guys who I think own the mag. They genuinely had no idea what happened to these lions and had been given the story that they would be released back into the wild. Great opportunity to give them ”the talk” and request that they not have such articles in future. They took a pile of our flyers and were really apologetic. Sunday started off a little quiet but soon picked up and seemed to come in waves. Linda, Drew and Stef Oels there all day. Chris packing and taking hound to kennels before heading off to the bush – lucky thing! We again had the opportunity to chat with people and answer questions. 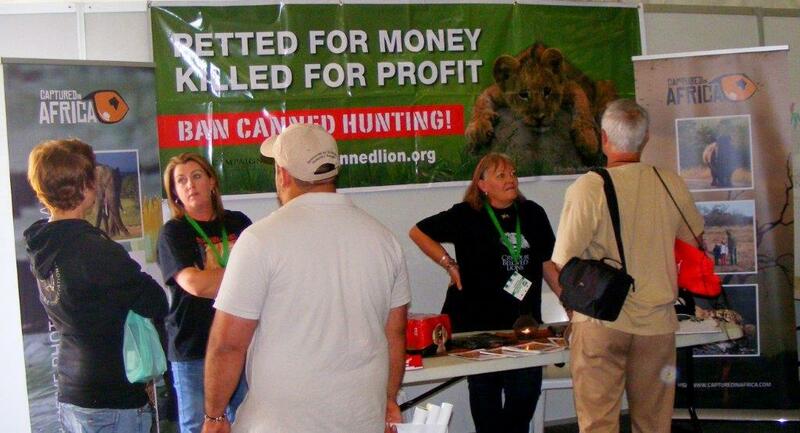 We even had someone from Gauteng Nature Conservation drop by the stand to express his disgust on canned hunting. Both Saturday and Sunday we had people raising questions about certain places and whether they were ok to visit. It was good to see that they had revised their travel plans once they had been shown the light. Sunday night we broke down the stand and some very tired people headed home. We did not sell a lot of T-shirts interestingly enough but the general consensus with other exhibitors was that people were not spending money this year. 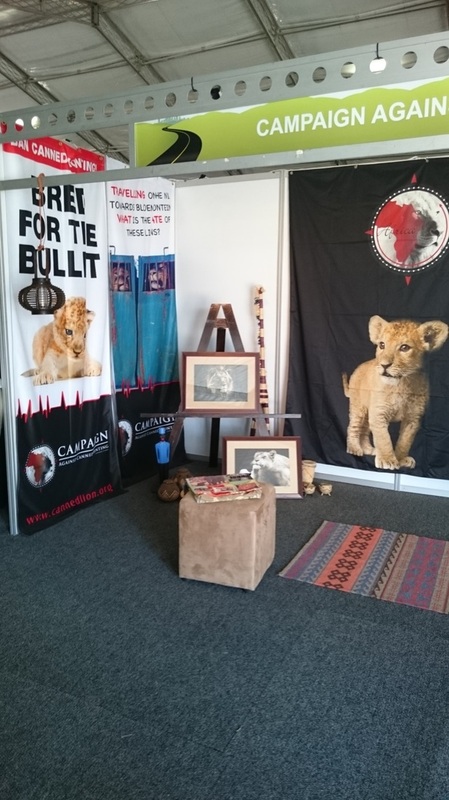 The two things that grabbed the most attention on the stand were our banner and the framed A0 poster of the two lions in crates. People were going away and then coming back with others to get them to have a look. All in all I think a very worthwhile 3 days where we seemed to have made an impact and shifted some minds. We should have a lot of new people signing up for the CACH newsletter I think. We were immensely grateful to be given a stand in the NGO section of the Outdoor Expo this year. This was our first stand of this magnitude and we were not sure what to expect. The response from the public was fantastic and we were kept extremely busy talking with visitors, being filmed by CNN and Discovery/Animal Planet and educating people about the plight of lions in captivity. It was extremely heartening to see how many children were keenly interested and promised to take what they had learned back to their class mates. The passion these children showed for our wildlife bodes well for the future. Our daily talks in Speakers Corner were well received and a lot of awareness was created as a result. The Outdoor Expo gave us a tremendous amount of exposure that we would not ordinarily have had and was most certainly worth the tired feet at the end. Many thanks to Shirley and her team for inviting us and for putting on a great show.